There are certainly many ways to attack (strikes and thrust) in Kendo, but only a few count as ippon in a shiai (official match). So, what makes an ippon? There are four essential elements to make an attack an ippon. First, you must use the correct “datotsu bu” of your shinai to attack. For striking attacks (kote-men-do) – the area of impact (contact) is between the sakigawa (leather covering the tip of the shinai) and nakayui (leather knot), which represents the mono uchi (the cutting part) of a katana (Japanese sword). For thrusting attack (tsuki) – the area of impact (contact) is the sakigawa (the tip of the sword). To get the datotsu bu right, however, you need to have a good understanding of the distance. Second, your attack must hit the correct targets of “datotsu bui” of the opponent. When your opponent is on chudan no kamae – there are seven areas that you can hit. 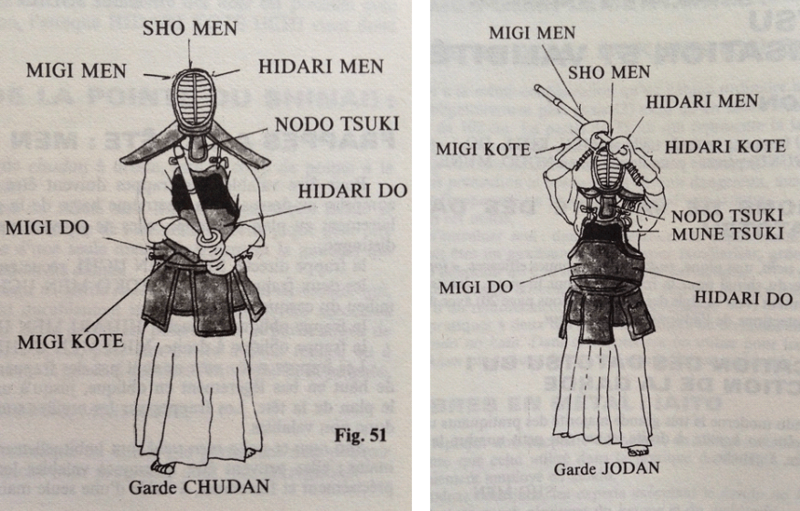 Source: Pictures from Hamot and Kenichi (1995) in Découvrir Le Kendo. When your opponent is on jodan no kamae – there are nine areas that you can hit. Third, your attack must demonstrate correct execution of “ki-ken-tai no uchi”. ki: using sufficient (that is, the right amount of) energy. ken: correct handling of the sword. tai: moving in with proper posture and throwing the whole body including the kiai (expressing your fighting spirit with a strong shout) into the attack. no uchi: executing all the actions above in one (that is, coordinated and harmonious) movement. Each element of ki-ken-tai no uchi is a subject of its own, and it would be too long to write them in this blog. Let’s explore these points more in detail during our practice. Fourth, you must ensure that your attack finishes with powerful “zanshin”. Zanshin is non-physical, so it’s hard to explain plainly. But commonly, zanshin can be observed in the following actions. Making sure that there is no room for the opponent to counterattack or undermine your attack. That said, getting all the elements of ippon goes well beyond the physical ability and technicality. Yuko datotsu (making a successful ippon) comes with much practice, observation, self-reflection and of course, keiko experience. It is a self-learning experience, so always keep these points in mind when you practice. That way, every practice, every keiko, every waza, and ultimately every attack will be an opportunity to learn about and achieve ippon. In that sense, yuko datotsu is a state of body, mind and spirit.